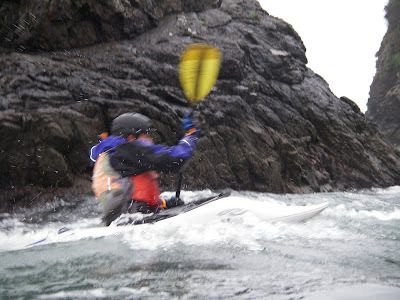 Recently I picked up a dvd from the library called Paddle to the Sea. It is based on the children's book Paddle to the Sea by Holling Clancy Holling. It was a delightful film, and I just discovered that it is posted on YouTube. The phrase from the film "Please put me back in the water" has been resonating in my head over the last week as I have been displaced from the sea. I have been in the pool swimming and life guard training so not totally displaced from the water but my soul craves the sea. 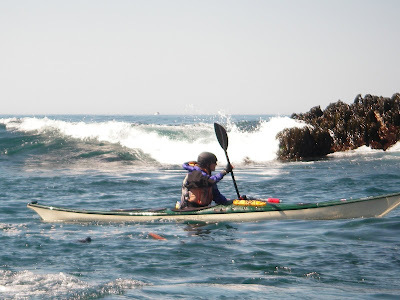 Craving the ocean and paddling - is it an addiction? The psychologist William Glasser talks about positive addictions that we create for ourselves. So my spin is that paddling must be a positive addiction - a need that my body, mind, and soul seek for pleasure, release, and solace. With that thought, I am off to paddle to the sea. 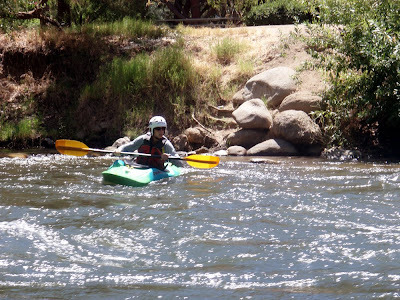 Guess I am the Goldilocks of kayaking . . . constantly testing out this boat and that and being hopeful that eventually I will find one that will be "JUST RIGHT." When will I find the boat that is just right for me? Statistics say that the average height for US women is 5'3" to 5'4". So at 5'4.5" why do I have so much difficulty finding a kayak that fits? 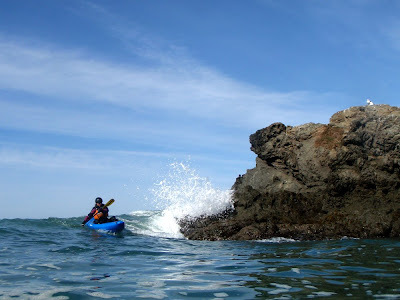 Especially in the realm of whitewater kayaks. 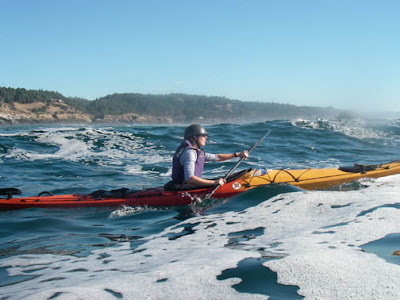 Sea kayaks by nature are narrower and manufacturers have started working on low volume designs that are more friendly smaller adults. 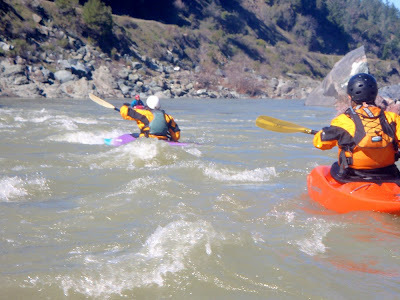 I just deleted a whole rant about whitewater kayaks but will save that for another day. Currently there is an Eskimo Kendo Starlight sitting in our boatbarn that Goldilocks thinks is going to be "JUST RIGHT." Yes, I am officially guilty of pedaling this week more than paddling. 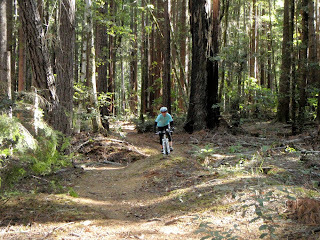 Oh, but mountain biking in the Mendocino Coast redwoods is so much fun, the traction is great, I love my new bike, and the whole gang is doing it. 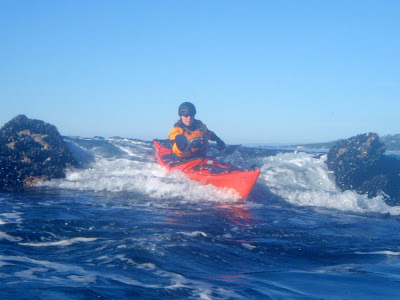 Besides, I am not really keen on paddling in the 20 to 30 kt winds that we have been having. 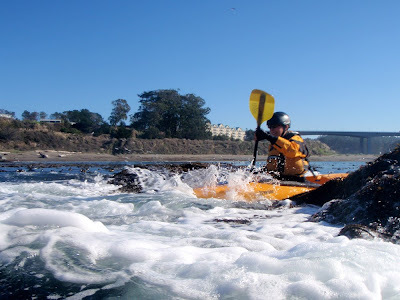 We are getting some new boats tomorrow so I am sure that given high winds or high water - we will be paddling this weekend.